I felt a bit funny that morning not really sure what to do with myself. Monkey was very excited and looking forward to seeing his teacher again and playing with his best friend. Who was also going to the same school although in a different class. He kept asking if it was time to put his school uniform on and his school shoes must have come on and off at least six times. I had printed out a little sign for him to hold up when we had the first day at school picture. I thought I would weep but I didn’t, his excitement was infectious. 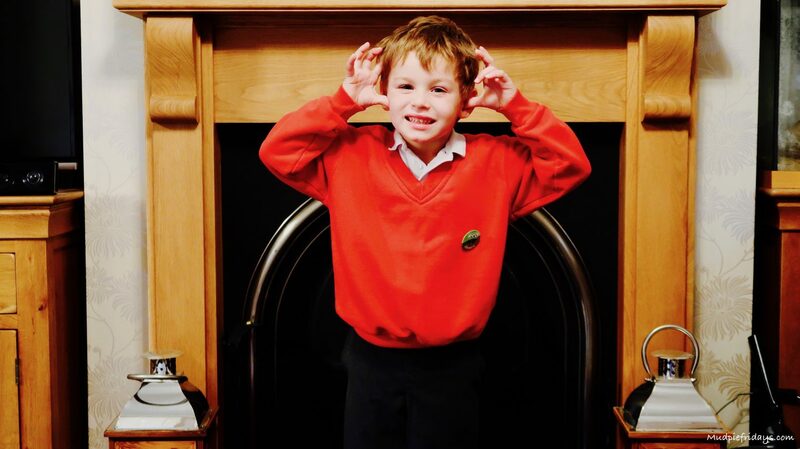 Having practiced putting on his school uniform at nursery when the time, (came after a big lunch didn’t want him getting hungry) he raced upstairs as quickly as his legs would carry him and was almost dressed before I even made it to the top of the stairs. He looked so smart in his new uniform, his book bag and clear water bottle. Everything was labelled and ironed, his PE kit was folded neatly. Walking along the school drive into the playground and into the classroom was such a special moment. The school had done such a good job at getting them ready for this moment I did not see one upset child. Monkey run off and was entertaining himself with various toys which had been put out to ease the transition away from the parents. He almost didn’t say goodbye. We left and he was already forming friendships. Thankfully this wasn’t a one off and we have never suffered with the ‘mummy I don’t want to go to school‘. I am sure it will come in the years to come though. Thankfully we have survived the first year pretty unscathed although there was the issue with fishcakes… Every Friday is fishcake Friday. Monkey has always eaten fish, he’s also always had the ability to make himself sick. Well he has decided he doesn’t like fishcakes at school and so for a couple of weeks on the trott he would make himself sick in his dinner. Now the school had to send him home, but they knew just as I did that he was fine. I can still remember the teaching assistants face when I picked him up for the second time. After that we had a pack lunch on a Friday and I have only ever forgotten it twice… not bad! School settle days – the school had a number of half days before the Summer holidays, some where we stayed and some where we didn’t. It was a very gradual process and revolved mainly around story times. Like most children Monkey loves stories so this really works for him. It also gave us something to hang onto and talk about at home. Books – I brought a couple of books that talk about starting school which helped with the conversations at home. School was something we spoke about a lot. It became part of everyday life. Uniform & Shoes – Monkey came with me to buy both and he loved picking them out, racially the shoes which had flashing lights on. After we had brought the shoes we went to the ice-cream parlour and he chose the biggest ice-cream going. Which serves me right for letting him choose whatever he wanted on the menu. Getting dressed – The nursery Monkey went to, and at home we practiced putting on and taking off his PE kit which really helped his independence. Marks and Spencers have built a campaign around just this. They have asked a group of teachers to share some funny, sweet and interesting anecdotes of what really happens when parents leave their kids at the front gate. Wanting to reassure both children and parents that the teacher is there to be their guide, to inspire confidence, and that they really have seen it all before. The #TrustMeImATeacher is now live on their website and its definitely worth a read. One lesson for me these last twelve months is to learn to cherish that school run. As all too soon it it will be over and they won’t want to hold your hand on the way up to the school gates. Or come running out of class with their arms wide open shouting ‘mummy‘ or ‘daddy‘ with their book bag trailing somewhere behind them. Try not to hate the rain, or those last five minutes before you leave the house – running late again, the reluctance to put on the school shoes after being asked for the fourth time. Embrace the school years as much as you can, the assemblies, parents evenings, country dancing and sports days. As for us, well we are getting ready for year one and I am determined to make it out the house on time this year..
What a great post. I’m pleased monkey has done so well. My eldest starts school in September and like monkey she is very excited. Her school have done lots of settling sessions too. We’ve also been reading lots of school books and have most of her uniform sorted. Ah I love this, thank you for including my suggestion. 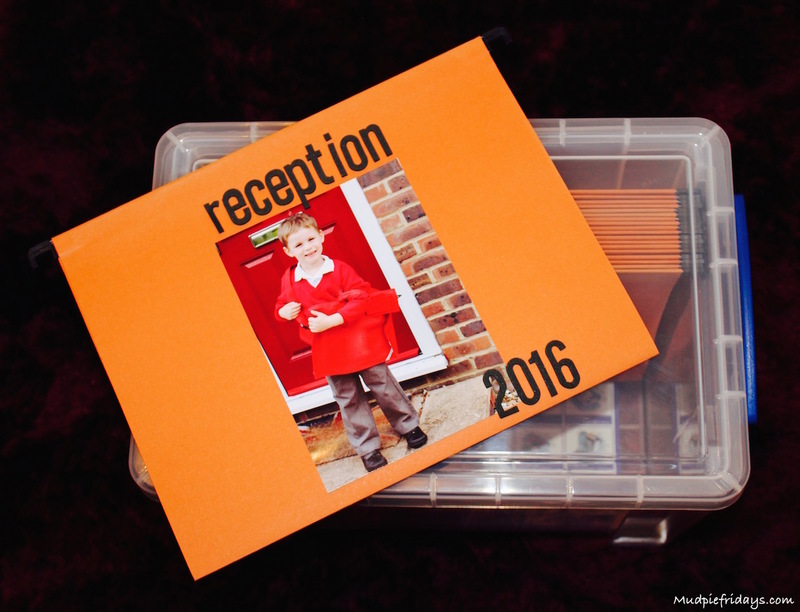 It sounds as though monkey has done so well in reception year, and well done to you too as I know it’s difficult – especially that school run! It can be so hard for them to settle in, you know we’ve been through the mill with Eva, but I’m hopeful that year one will be a little easier. And I do am hoping we won’t be late this year!! Such a lovely post ???? my daughter took to school so easily – it was me who was an absolute mess! These are some wonderful ideas to help kids settle into starting school. It really is a huge change & takes a lot of getting used to. I love Laura’s idea of drawing a little heart in her hand & in her daughters. What a wonderful post filled with so many different ideas. I would never have thought of some of these. Thankfully I’ve got a couple of years until I have to worry about this yet but I guess it will be here in no time at all! Completely agree about it taking a lot of work beforehand to build confidence ready for a child’s first day at school; we too also had the staggered approach which in hindsight I’m really grateful for as it allowed Boo to feel settled at her own pace without feeling rushed… Aren’t children marvellous! I love this post. I cannot believe that Bella is going into year one soon, it seems like five minutes ago that she was starting. Now i have three in school I can honestly say that once they start, time seems to really fly. I only have Elsie left at home now and then thats it! What a lovely post! Now we need a post on how tearful mums can cope with waving their little ones off on their first day of school lol! Such lovely ideas! My son is nowhere near school age yet, but I hope to remember some of these when the time comes. 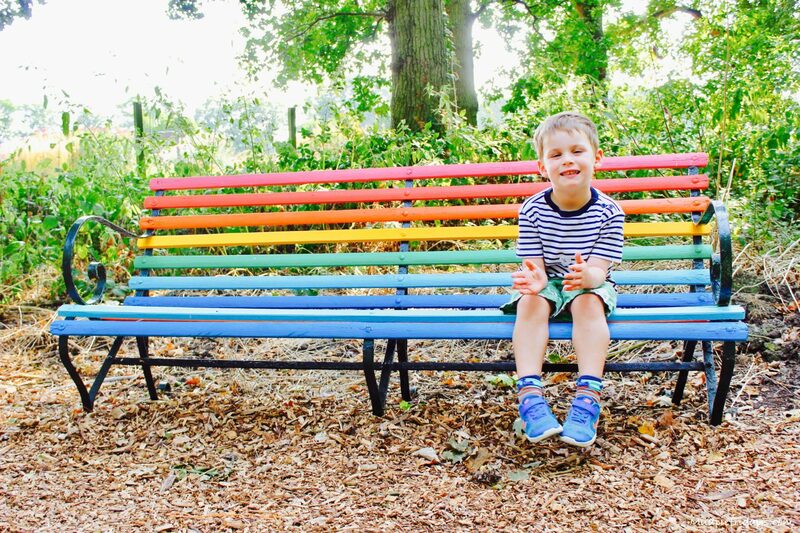 My middle son starts school next week, and he’s totally confident (as am I) thanks to the settle days before the holidays. Much better than when my 15 year old started school, where they basically had no introduction at all. But I love some of the other ideas here too. great post and lovely photo! I know I’m ridiculous but reading this post made me feel a bit anxious 🙁 I love the idea of giving them conversation starters. I could do with that sometimes. My niece is moving up to year one this time. We’re nowhere near ready. My niece is moving up from reception this time. She loves it and is always talking about her friends. I blinked and now my twins are 22! It goes very fast! This is such a great post, the first day of school, well actually, the first few days at school, even weeks can be very difficult to adjust too and I found that the introductory days where our LO could meet her teachers, have a look around her classroom, meet some of the children she would be there with did help her a little. What a lovely and thoughtful post. I must confess that I have never thought about appreciating the school run.